With sincere thanks to the Friends of the Princeton University Library, the Graphic Arts Collection has acquired this nearly 8 foot assembled panorama of Paris from around 1655. Gravée [Gravure] à l’eau-forte et au burin par Noël Cochin (Troyes 1622-Venise 1695) et imprimée sur 4 feuilles de papier verge. = Etched and engraved by Noël Cochin, printed on 4 sheets of laid paper. The central engraving is completed at the top by the title (carved in wood so letters print white) “Lutetiae, vulgo Paris, Urbis Galliarum primariae, non Europae solius, sed orbis. Totius celeberrimae prospectus, N. Berey ex.” and at the bottom and sides by 18 prints representing the King, the Duke of Anjou, and 16 monuments or particular views of Paris. 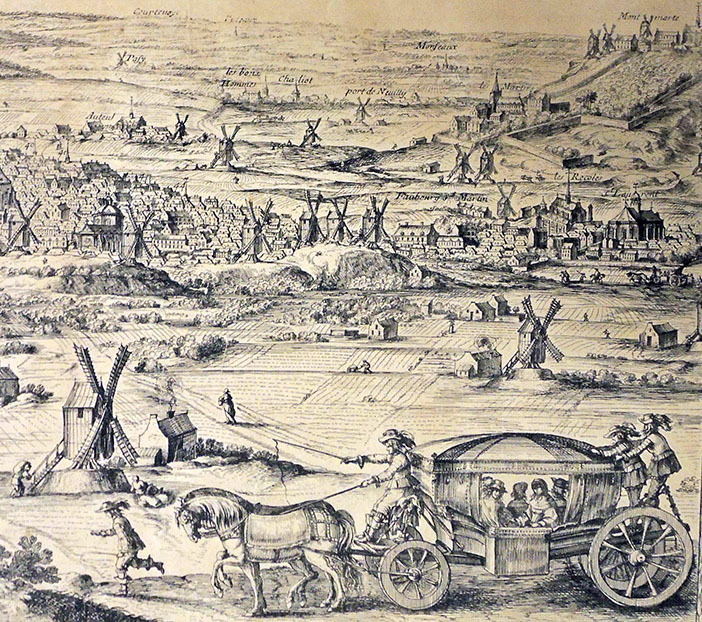 The panorama forms a circle from the Abbey of Saint-Antoine on the left (southeast) to Montmartre in the north. 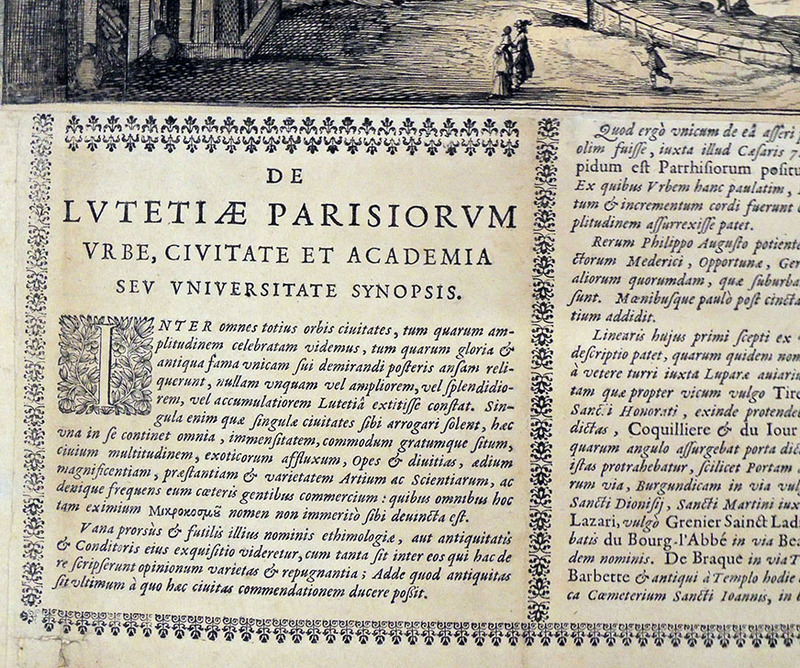 Note the words “Totius celeberrimae prospectus.” With more than four hundred thousand inhabitants in the 1650s, Paris was the most heavily populated city in Europe. This prospect conveys its density, showing the city packed into a basin in the midst of hills in which it would later rise, causing the windmill sentries to disappear. 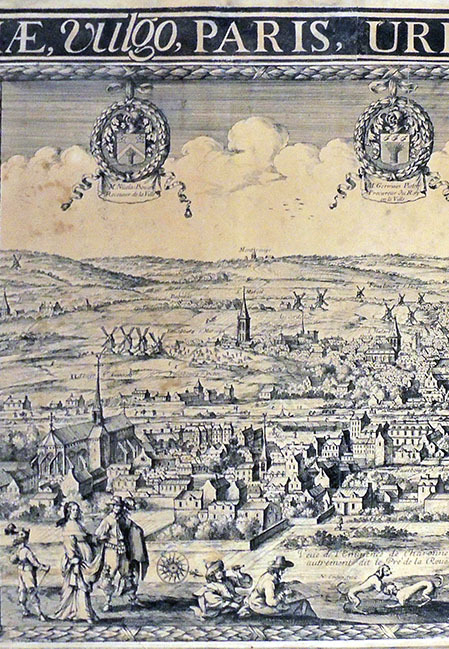 Cochin assigns the starring roles to the churches, which provide the only important verticals besides those of the strongholds of the Bastille and the Temple. 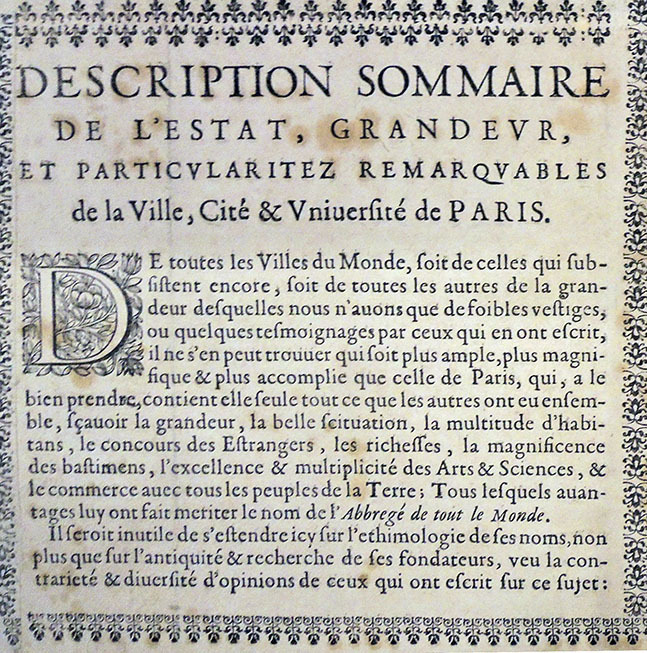 An additional 18 columns of letterpress text in French and Latin form the bottom row, listing and describing the views presented (loosely translated, Brief Description of the Estate, Grandeur, and remarkable particularity of the City, ‘University of Paris.’). See also: Catalogue de livres et estampes relatifs à l’Histoire de la ville de Paris et de ses environs provenant de la Bibliothèque de Feu M. Hippolyte Destailleur, n°157. Sue Reed, French Prints from the Age of the Musketeers, no. 59. As indicated by his sign, “Aux deux globes” on the Quai des Augustins, Nicolas Berey primarily sold maps and topographical views. He seems to have opened the shop around 1639 and joined with Antoine de Fer to buy the copper plates from Christopher Tassin. It was a neighborhood where other publishers and merchants of intaglio prints were also located at that time. Among his other cartographic works is the Carte Generale de toutes les postes et traverses de France, published around 1640, with all the routes and stops of the postal services in France in the second quarter of the 17th century. At his death in June 1665, his son Nicolas (II) continued the publishing and running of the shop. Unfortunately, only two years later the young Nicolas also died, leaving the shop and printing in the hands of Alexis-Hubert Jaillot, who was married to Jeanne, the daughter of Nicolas and half-sister of Nicolas (II). In an interesting side note, the engraver Noël Cochin (brother to Nicolas Cochin) was illiterate, quite a rare for a printmaker at that time. Since he could not sign (engrave) his name, he would draw a small cavalier, charging on horseback, at the bottom of documents and prints. This entry was posted in Acquisitions, prints and drawings on February 8, 2019 by Julie Mellby.